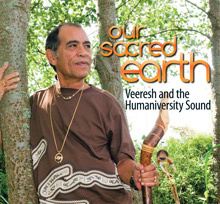 This meditation is created by Veeresh at the Humaniversity with the message 'This Earth does not belong to us, we belong to this Earth'. It has 10 stages and involves dancing and shaking. Through stages of shaking, gentle movement that loosens the muscles and releases tensions, of dancing, stillness and hugging, you can let go of stress and worries that keep you from enjoying life. 1. Dancing, let your body move to the music. 2. Shaking, let your whole body shake. Focus on shaking your wrists, as it releases stored toxins in the body. Relax on your out breath. 4. Shaking, increase the intensity of your shaking. 6. Shaking, this time put all your effort into shaking and shake as total as you can. On every out breath express your feelings (negative or positive) by making a sound. Build up the energy as the shaking develops. 7. Sit like a Buddha in silence, listen to the music and look inside. 8. Lie down on your back, spread your arms and legs, close your eyes. Connect with the earth and listen to Osho. 9. Meet everybody, give each other gently a ‘High Five’ and exchange this statement: “I promise to take care of our earth” and then hug. 10. Hold hands, say to each other “This earth does not belong to us, we belong to this earth” and hug.